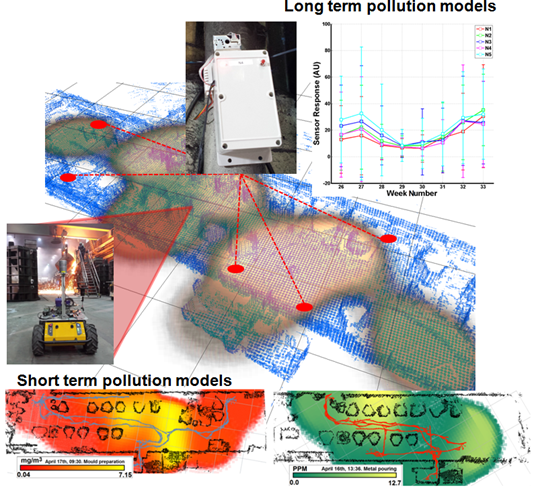 Robot-assisted environmental monitoring is all about detecting, mapping and understanding environmental factors in our surroundings with the help of mobile platforms and stationary sensor nodes. These factors of interest include simple concepts, like temperature or humidity distributions, and more challenging concepts, like dust exposure models in work environments or distribution maps of fugitive gas emissions. It is thereto closely linked to the Mobile Robot Olfaction and Rich 3D Perception areas. The goal is to produce micro-scale indoor and outdoor weather maps that help occupational health professionals to assess risks to people and facilitate corrective actions. The distribution of particulate matter and gases is influenced heavily by local airflow conditions. Turbulent (chaotic) eddies and vortexes intertwine with laminar (structured) streams of air, which makes modelling the resulting air flow quite challenging. Artificial ventilation systems in industrial environments attempt to control this flow, yet often their actual effect is hardly understood because of the numerous complex interactions it creates. We designed a joint probabilistic representation for wind speed and wind direction that is computed based on robot measurements. Furthermore, the model indicates areas of high and low turbulence. 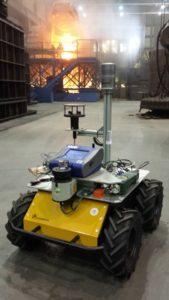 We developed a mapping procedure to combine robot measurements with data collected by static sensor nodes. It conserves and models not only the spatial relation between all the measurements, but also captures temporal dependencies. The results are then evaluated in the context of common procedures used by occupational health specialists to assess dust exposure of workers in these environments.